MP-Pushbuttons, Accurate, switching, on smallest areas under extreme conditions. The wear-free ESCHA TSL MP-Pushbutton is designed with an airtight single-piece housing . The mechanical design guarantees high durability regardless of temperature, dust and humidity. The MP-Push Button is weather resistant, wash tunnel proof and resistant against chemical detergents. 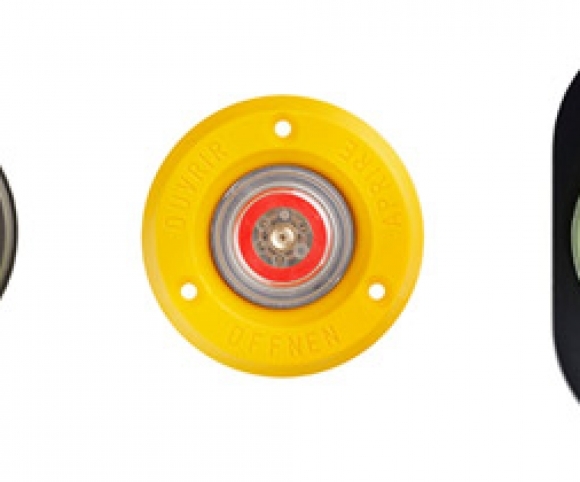 For more than 20 years Vehicles worldwide have been equipped with this Push Button series. As the smallest of the ESCHA TSL Pushbuttons it has a mounting dimension of just 30 mm. Four LEDs indicate the stand-by – and switching status. In addition to the green/red LEDs of the basic model other individual LED Color combinations are possible. The MP Push buttons are available in different colors for both the Inside ring and Mounting ring. The large selection of available colors makes it possible to color coordinate the pushbutton to the color of the vehicle. The MP-Push Button series meets all the standards for the use in Busses and rail vehicles. The Push Buttons are also available as TSI PRM conformable version for people with reduced mobility. Microcontroller electronics make a wide variety of functions possible such as extended voltage ranges, optical signaling and integrated timer functions. Therefore,individual customer needs can easily be met with the MP Push Button series. Beyond the single Push button ESCHA TSL offers a customized Panel solution for the direct installation for example in wet rooms.